All rose lovers of the world will be thrilled to know that Beijing is very soon to be the home of a new, exciting museum , completely dedicated to ROSES !! 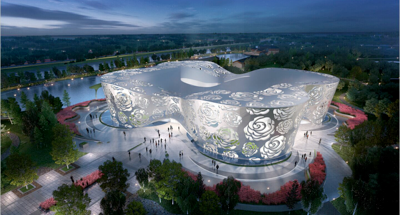 Due to open in May, 2016 the Museum’s inauguration will be the grand event of the Regional Convention of the World Federation of Rose Societies and the 14th International Heritage Rose Conference, both being held in Beijing that month. The Museum will have 17,000 m2 of space dedicated to the science, history and culture of this incredible flower. Rosa laevigata, Rosa ‘Old Blush’, Rosa ‘Park’s Yellow’ and Rosa ‘Mutabilis’, all visible here on my website.